7x09 - Larger Than Life - Behind the Scenes. Behind the scenes of “Larger Than Life.”. Wallpaper and background images in the House M.D. 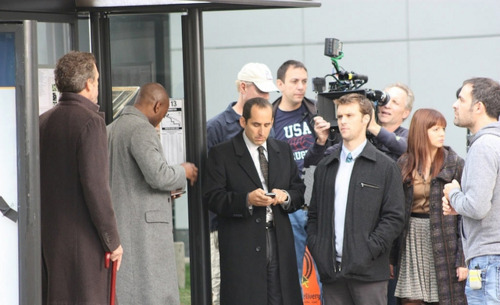 club tagged: season 7 house md larger than life behind the scenes 7x09 hugh laurie omar epps jesse spencer peter jacobson. This House M.D. photo contains کاروبار سوٹ and بزنس سوٹ. There might also be اچھے کپڑے پہنے شخص, سوٹ, پتلون سوٹ, pantsuit, اچھی طرح کپڑے پہنے ہوئے شخص, پنٹساٹ, سوٹ, کپڑے کا سوٹ, لباس سوٹ, مکمل لباس, tailcoat, پونچھ کوٹ, دم, سفید ٹائی, سفید ٹائی اور دم, تالکوت, and دم کوٹ. تصویر of Lisa E and her family on Cuddy's desk! Greg, why did آپ do it? - Part III.